Notes: Based on the manga by Sawai Yoshio, which originally ran in Shonen Jump. Viz released a few volumes of the manga beginning with volume 8, but the series is now out of print. Bobobo is a man who can read other people's hair, as well as use his own hair to fight against the evil Margarita Empire, who are trying to steal other people's hair to give more power to their emperor. Along the way he'll be joined by other companions, including a girl named Beauty and an odd, sun-shaped thing called Don Patch. There comes a time in one's life when he witnesses an event so strange, so out there, so messed up he cant describe it with words, emoticons, or even funny facial expressions. He just sits there, wondering to himself, "What the Hell is going on here?" Because in some cases, especially in the case of Bobobo-bo Bo-bobo, even if you could make out what you saw in words, you'd sound either really stupid, or really nerdy that you put THAT much thought into what is the weirdest anime to come down the pipeline since FLCL. This show is darn weird, and the first couple of episodes were among the weirdest I've ever seen in an anime. Ever. The dub made it even more over the top, with ad-libs of quotes and references to pretty much everything under the sun. If it could keep up the pace for a whole season, it would be right up there with Excel Saga as one of anime's comedy greats. By the time you get to episode five you may find yourself switching over to some other series to watch in no time. There's no more shock value after a while. Seeing Bobobo fighting bad guys with his nose hairs (no joke) is funny the first time, but when he does it EVERY episode, it's no longer shocking or weird. This also applies to his cross dressing, stuffing popping out from the top of his head (such as elves, animals, and even a small version of himself in one episode), and his crazy dialogue. 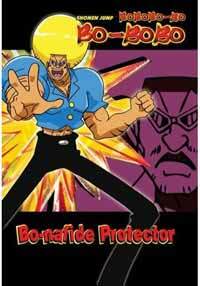 Bobobo tries to top the weirdness he brings from the previous one so hard that eventually it's no longer interesting, and there's not enough in the jokes or plot to keep up the pace. If Bobobo wasn't the only really entertaining character in the series, this wouldn't be a problem. But he's the main star, and he takes up so much air time that no one else gets to do much of anything. Not even his good buddy Don Patch (who looks like a small sun with arms and legs) can spice things up after too long, despite their occasionally hilarious performances together. As for the "heroine", Beauty; she's boring with a capital B. She's not so much a heroine as much as she is a character who just stands there being freaked out by Bobobo and Don Patch's childish antics. And the villains, though amusing, are more-or-less one-shot characters who you'll easily forget once the episode is over. Although the art style of the characters are unique (save Beauty, who has the generic Shonen Jump heroine art design), the frame rate is bad (with endless recycling every episode), the backdrops aren't very detailed, and it's just not very attractive to look at. It's faithful to the manga art style, and that's all the good I can say about it. Although it does have a few hilarious moments of pure insanity, Bobobo-bo Bo-bobo tries way too hard to be funny. At least with Excel Saga you had somewhat a plot, as well as a foray of strong leads AND secondary characters. Bobobo himself can't carry the show, as amusing as he is, and I would be-hard pressed to find anyone not Japanese who can watch more than five or six episodes of this without giving up, let alone the seventy-six episode span the series runs for. Recommended Audience: Most of the action is regulated to slapstick violence and nose hair whipping. The infamous "phallic duck" as described in the synchro sessions for this series on the THEM Boards isn't nearly as disgusting as it sounds.